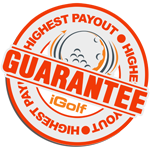 iGolfValueGuide.com may share information with governmental agencies or other companies assisting us in fraud prevention or investigation. We may do so when: (1) permitted or required by law; or, (2) trying to protect against or prevent actual or potential fraud or unauthorized transactions; or, (3) investigating fraud which has already taken place. The information is not provided to these companies for marketing purposes. Your personally identifiable information is kept secure. iGolfValueGuide.com does not sell, rent, or share personal information about you with other people or nonaffiliated companies except to provide products or services you've requested or when we have your permission. All emails and newsletters from this site allow you to opt out of further mailings. You may, at any time, review, edit, and/or remove any information we have stored on you by contacting iGolfValueGuide.com through e-mail at CONTACT US. We will promptly comply with any request to review, edit, or remove information.